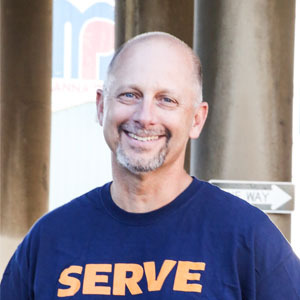 Brad Meuli is the CEO of the Denver Rescue Mission. Follow them on Facebook, Twitter, Instagram, and YouTube and learn more at denverrescuemission.org. I have the great honor of being the President and CEO of Denver Rescue Mission, a 127-year-old Christian organization providing emergency services, rehabilitation, transitional programs, and community outreach to people experiencing homelessness. Our goal is to help people become productive self-sufficient citizens and leave behind life on the streets. Being a man of faith in a faith-based organization, the short answer is I believe God has called or directed me here. I like being able to make a difference in people’s lives, to see them move out of poverty and have their lives changed forever. Just seeing the transition in one person’s life is enough to keep you going for a very long time! In addition to feeding people (more than 900,000 meals served last year) and providing shelter beds (more than 400,000 nights of shelter this past year) we are seeing people move out of the shelter system and back into society. We are seeing people leave our program free from alcohol and drug addiction and because of that are reunited with their family— families and relationships restored, husbands reunited with their wives, dads reunited with their children, and men connecting with their parents, sisters, and brothers once again. It is pretty exciting when someone moves out of homelessness and addiction into a new life. I sound like the minister that I am when I say that because Jesus loved me I want to share his love with others. Jesus called us to love our neighbor as ourselves. This can be seen through a saying that I love: “If you can tell a man’s character by what he does for others who can do nothing for him.” I would like to be a man of character. I want to see one life after another be changed because people have come to the Mission seeking hope. One person, one relationship at a time is all we are trying to do. We do not ever have to build another building as long as we can reach more people with hope for a life out of homelessness. This wonderful community we live in has been very supportive of our work. No one wants people in Denver to starve to death, or freeze to death. Our donors entrust us to help make sure this does not happen. We continue to try and be worthy of this support and I am hopeful that this community will continue to support our efforts financially, by volunteering, and by praying for us. There is a lot of work to do and we are excited to do it! We continue to see an influx of people who are homeless and meeting this challenge has caused us to have to expand and rethink the best ways to help people out of homelessness. When we opened the Lawrence Street Community Center, our day shelter, three years ago we were hoping for 300 people to come in every day. In reality, we average more than 1,000 people. This continues to be a challenge, just meeting the needs of so many. Reach out to someone today, get involved, volunteer, ask your neighbor if he or she needs some help, look for ways to serve. It is not always some huge thing that makes an impact, it is the small things, it is caring about others. We are always so appreciative of the community support we receive. We would love to have people volunteer with us, help us financially, and if you are a person of faith, pray for us. Perhaps when you see someone panhandling on the street corner think of us and our work with the poor and needy and think about how you might want to help. I am so thankful for this incredibly generous community we live in!